As a scholar and gentleman, I have never understood racket abuse. 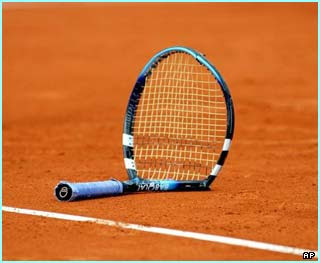 Why do tennis players periodically destroy their rackets when something bad happens? Believe me. It is not the racket's fault something bad happened. In other sports, similar abuse is rare. In basketball, it would seem wrong if a player knifed a ball. In football, it would be strange to set a first-down marker on fire. In baseball, the bat does receive some abuse, including being snapped in half over fat men's knees, but after some analysis, it is safe to say no sports equipment's abuse compares to that of a tennis racket. Upon further reflection, what I truly don't understand is how a tennis racket stays with a player, even when that player is prone to abuse. This phenomenon made me want to understand life more and, thus, convinced me it would be worthwhile to interview John McEnroe's Dunlop MaxPly. Snooze Button Generation: Thank you so much for this interview. I've always liked John McEnroe - and his racket. Dunlop MaxPly: No problem. We rackets don't get the attention we deserve, so we're always open with the media. It's my pleasure. SBG: So what was it like all those years, being the extension of McEnroe's left arm? Dunlop: It was great. We were together in thick and thin. We won three Wimbledons, four U.S. Opens. It was a quite a ride. SBG: Well, one reason for this interview, as you know, is to delve into the under-examined problem of racket abuse. ... Did you ever feel Mr. McEnroe was out of line with you? Dunlop: Out of line? Nah. We all know John has a temper. But he always treated me how I deserved. SBG: Did you feel like a victim of racket abuse? Dunlop: Oh geez. No. Of course not. SBG: How can you say that? We have countless videos of you being tossed to the ground, kicked and thrown. You don't consider that abuse? Dunlop: Oh, you just don't know John like I do. He did it all out of love. He never did anything inappropriate to me. SBG: But what about the video above? How could you possibly deserve that treatment? Dunlop: Look, man, I mess up too. My grip is 4 1/2 inches, and sometimes, John would have made shots if my grip were 4 3/8ths. I'm not perfect. I'm just trying my best. SBG: OK. I guess. But it sounds like you're just rationalizing the abuse. What about racket abuse in general? Do you see it as a problem? Dunlop: Yes, I absolutely do. What scares me is the escalation in racket abuse. If you look at tennis players nowadays, they're much more violent than John was or Ivan Lendl or Bjorn Borg. It's scary, and it's on a global scale. It should be stopped.